If you’re a fan of paranormal fantasies and fairy intrigues along the lines of Seanan McGuire’s October Daye series, you should read Alex Craft‘s tale. Kalayna Price has written a lovely series about a woman who can see the land of the dead, talk to Death, raise shades of the deceased, and more. There are fairies, love triangles, and more. The sixth book in the series, Grave Destiny, is available April 2. Find out more about the story, without spoilers (for the sixth book anyway). Grave Destiny is another wonderful entry into the world of Nekros, fairies, grave witches, and planeweaving. Alex Craft is a grave witch, but she’s also so much more: she’s actually a fae with a rare talent to planeweave. Grave Destiny sees her accepting her heritage and talents and searching for answers. And because it’s Alex, she also ends up stumbling into court intrigues, this time involving her “betrothed” from the Court of Shadows. Grave Destiny is brilliant as it finally begins to unravel some of the greater mysteries and larger issues surrounding the faerie realm. We are introduced to rulers from the Summer Court and the Court of Light, setting up future struggles. Grave Destiny also continues to show the struggles for Alex’s heart. Falin, Death, and now Dugan? Who will hold her heart? Who’s behind the current plot? I thoroughly enjoyed this entry into the series. It was satisfying on its own and also makes me that much more eager for the continued story. Grave Destiny sets up future plots quite nicely and I can’t wait to see them play out. From changes in Faerie, both large and small, and continued intrigues between and amongst the various courts. Another visit to Summer will be very interesting. If aren’t reading this series, give it a chance. While it does seem reminiscent at times of other paranormal series, it has enough differences to stand on its own. And if you are a fan of October Daye, you’ll be a fan of Alex Craft. 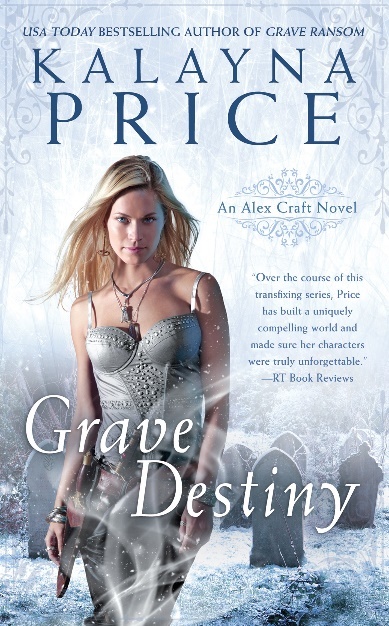 Grave Destiny by Kalayna Price is available from Ace on April 2. Pre-order now. The thrilling sixth book in the USA Today bestselling Alex Craft series. Kalayna Price is the USA Today bestselling author of the Alex Craft novels including Grave Ransom, Grave Visions, Grave Memory, Grave Dance, and Grave Witch. Ms. Price draws her ideas from the world around her, her studies into ancient mythologies, and her obsession with classic folklore. To find out more, please visit her at www.kalayna.com and connect with her on Twitter @Kalayna.